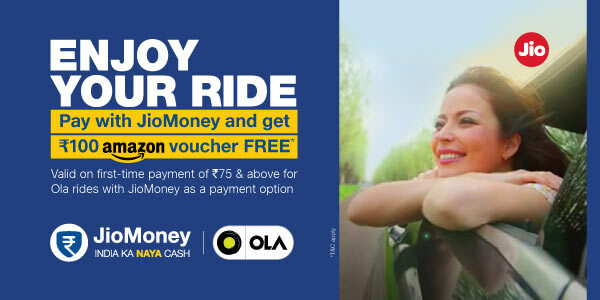 Get Rs 100 Amazon voucher on 1st Ola ride paid via JioMoney payment option on minimum transaction amount Rs 75/- on first transaction on or after 20th July. Offer period is from 20th July, 2017 to 19th September, 2017. RPSL reserves the right to disqualify any JioMoney Wallet holder/s from the benefits of this offer, in case of any fraudulent activity/suspicious transactions. In case of any disputes, RPSL decision will be final.